It may not be very pretty to look at, but this urban algae farm on an overpass in Geneva, Switzerland is doing a remarkable job. Installed by the French and Dutch-based Cloud Collective, it was one of 13 displays at the Genève: Villes et Champs garden festival over summer, 2014. 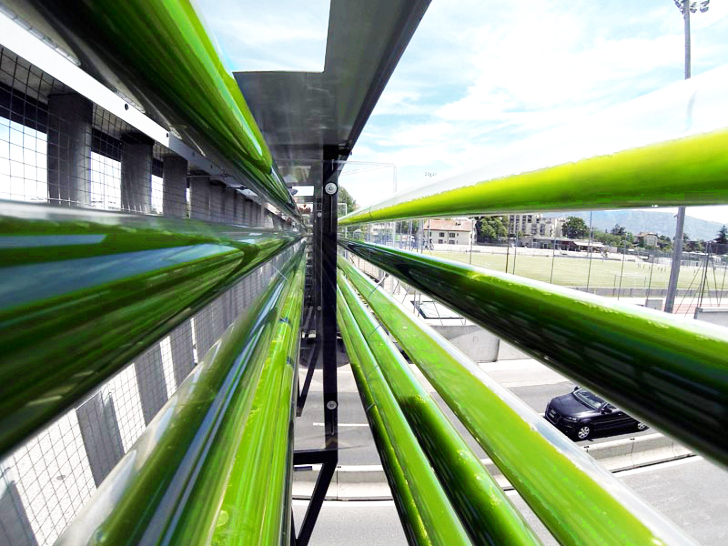 A solution of algae moves through the system of transparent pipes, feeding off the carbon dioxide expelled by the cars on the highway below. The installation was designed to demonstrate that even the most bleak of urban environments can be used to grow an abundance of biomass for food and fuel production. Culture Urbaine – The Cloud Collective from The Cloud Collective on Vimeo. The Cloud Collective’s Culture Urbaine Genève was one of the 13 gardens produced for the Genève: Villes et Champs festival. The festival “focuses on the co-habitation of the urban and the natural within the context of the urban expansion of Geneva.” The algae garden takes conventional notions of a garden and turns them on their head. It makes use the site’s abundance of carbon dioxide and sunlight and transforms a blighted landscape into a productive space. The algae produced can be used as combustible biomass, as raw materials for cosmetics or food, or simply for its air filtration properties. Of their choice of location, The Cloud Collective state: “Our site, a viaduct over a small highway, is particularly violent and quite out-of-tune with the idea of the garden as a peaceful natural haven. Instead, we focus on the character of the site and try to prove that even these locations of highways and car dealers – despite their anonymous and generic character – can play an important role in the production of food and biomass.” The Genève: Villes et Champs festival ran from 13 June to 4 October, 2014. This is such a win-win situation. And let me say, the hype about spirulina and other algaes is not just hype. Spirulina is a perfect food that gives you energy, a perfect balance of nutrients (lacking only Vit. C, pretty much) and loaded with anti-oxidents. And it tastes decent...actually it's good after the first few times, or you can just swallow it. Not only that, algae is great for aquaculture farming and even has industrial purposes. Not only that, other algae has been bred to produce like 70% oil, oil useful for lots of things including fuel. The algae garden makes use of the site’s abundance of carbon dioxide and sunlight and transforms a blighted landscape into a productive space. The algae produced can be used as combustible biomass, as raw materials for cosmetics or food, or simply for its air filtration properties. The system of transparent tubes is attached to the concrete siding of a viaduct highway overpass that also does double duty as a pedestrian and cycling path. A steel structure supports all the secondary equipment such as pumps, filters and solar panels, and also functions as a marker for the passing traffic below. Diagram demonstrates how the algae farm works. Didactic panels provide detailed information on the project for pedestrians and cyclists on the bridge. The project heralds a possible future for urban farming: a future that includes food and fuel production, the conservation of greenfield sites and the repurposing of existing infrastructure. The Genève: Villes et Champs festival ran from 13 June to 4 October, 2014.